Over the last few months I seem to have bought very little from Eric Fuller - this has mostly been due to the timing of his updates being whilst I was asleep and missing out on the ones I was particularly interested in and then also because I had spent my money elsewhere shortly beforehand. I'm sure that you must think that I buy everything in sight but unfortunately it's not true! If I did buy everything I wanted then Mrs S would murder me, skin me and bury me in pieces before dancing on the various burial sites before burning all my toys! I think she's being very unreasonable but I'm terrified of her and so always think twice before adding to my collection! Eric has recently completely redesigned his site and split his offerings into some new groups including his Signature puzzles which is the bunch we were all buying before and the Artisan puzzles which used to be called the Raleigh puzzles as more affordable and slightly simpler puzzles. Newly added to the site are the Gem series (smaller wood and acrylic puzzles) and a special Limited edition group which are similar quality to the Artisan group but only made twice a year in limited numbers and never to be repeated again. When the new site update went live again a few weeks ago, I happened to be in the kitchen doing the washing up after dinner and immediately stopped what I was doing and browsed the newest toys. There were lots that I lusted after but having just bought the Stickman twisty puzzle for an eye-watering sum (not that I regret it for a nanosecond), I felt that I had to be circumspect and avoid the wrath of she who must be flinched from. In the end I chose one of the Signature puzzles and one of the Limited edition puzzles. They arrived a few days ago whilst "She" was up in Edinburgh visiting her parents pre-Xmas. Thank goodness she has no idea what has arrived recently! It's not easy to come up with a new variation on the traditional six piece burr, but Juno came up with a great one! 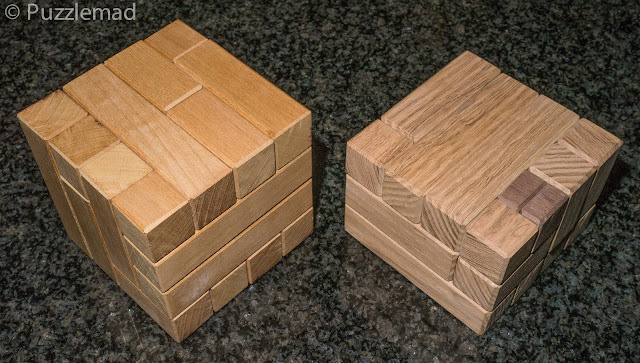 Because pairs of two pieces are off-centered, the assembled shape of the puzzle looks inaccurate though the pieces need to be accurate. The puzzle is based on one of the notchable sets of a level 9 combination. 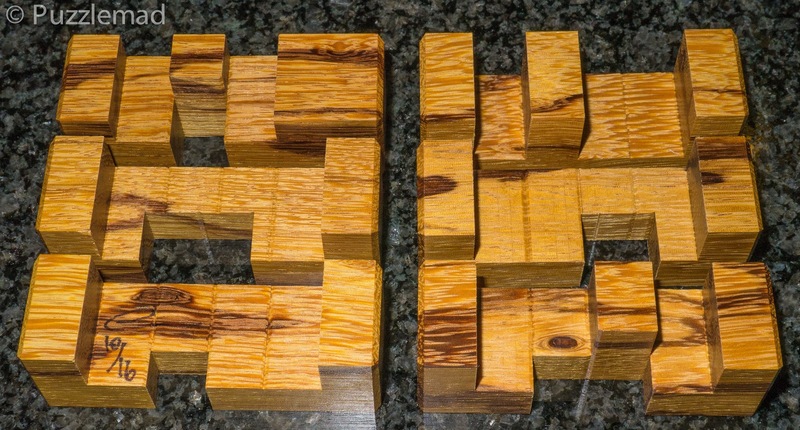 Thanks to the off-centered pieces the puzzle has unique solution and is very confusing to assemble! Construction of this puzzle is perfect! Tolerances are dead-on and fit is sublime. Inaccurate burr pieces - there is something very odd going on here! Looking at the picture it immediately jumps out at you that there is something wrong. The pieces are all notchable (i.e. can be cut with a router) and whilst most of the cuts along the length of 6 voxels are at 1 unit intervals, it is obvious that the depths and heights of some of the cuts are fractions of a voxel. 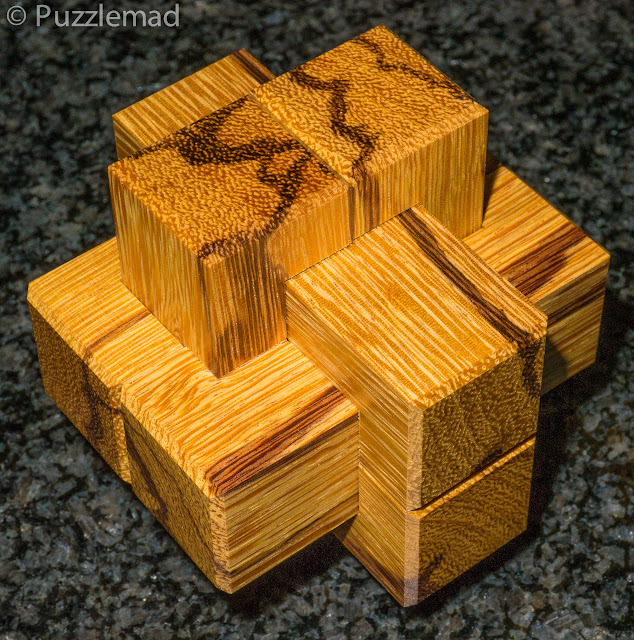 The other striking thing for me is how truly gorgeous the Marblewood is (I am lucky enough to have a full set of Laszlo Kmolnar packing puzzles in that glorious wood from the wonderful Brian Menold). I scrambled the pieces and left them a while before attempting my reassembly. It took me about 30 minutes (primarily because I seemed to be able to remember the disassembly) which was lucky because in retrospect I have realised that the puzzle might be very very tough to model in Burrtools! I am sure that a genius like Derek could do it but me? Probably not! There is something rather lovely about this puzzle - not hard but great fun and very beautiful! Loopy Burr was the other one that I couldn't resist (Lord! it was hard to stop at just 2). I wanted to see for myself what one of the new and slightly cheaper limited edition puzzles would be like. This one which appeared like another variant of a 6 piece burr was what tickled my fancy and at $33 how could I resist. The Loopy Burr came from the genius brain of Junichi; a very unusual six piece interlocking puzzle with pieces that form three intermingled loops once in the proper position. Finding that position takes eleven moves, and is downright tricky due to the space caused by the loops. Good luck! 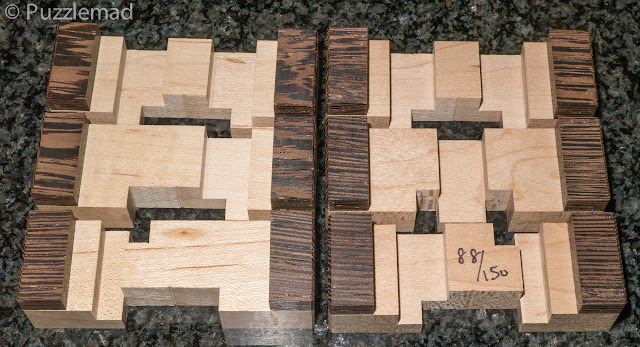 Construction of this puzzle is outstanding, with our usual precision down to several thousandths of an inch. 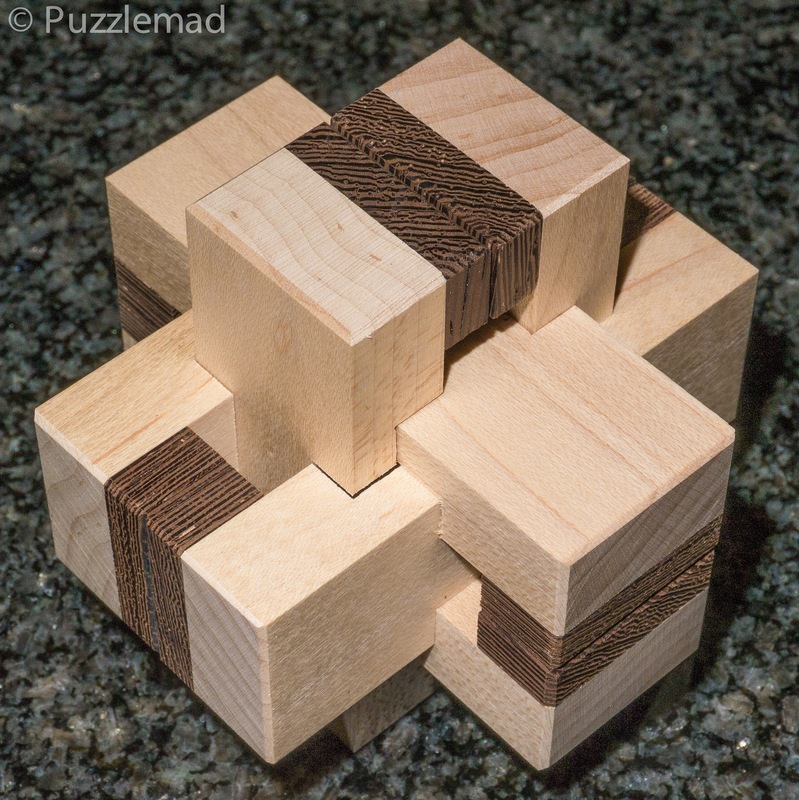 It is made from Wenge and Maple and definitely doesn't quite have the same finish as the signature puzzles. It is, however, still a stunning creation and very finely made as always. The loopy nature of the puzzle is immediately obvious and is a testament to the incredible warped brain of Junichi Yananose. I have quite a few puzzles designed by him and they all share the same unusual and confusing genius. The first thing that I immediately noticed was that the voxel grid that this is based on is quite a lot larger than a standard 6 piece burr - in fact each stick is based on a 4x3x12 shape and the entire puzzle on a 12x12x12 grid. This was going to be very tough! There are only a few moves possible at first but after about 3 or 4 then things become very confusing and I resorted to my usual exploration technique of make some moves and backtrack, make some more and backtrack again and hopefully lay down some memory tracks to aid in my solution and especially the reassembly. After about 7 or 8 moves I was hopelessly lost; I couldn't backtrack to the beginning and all I could do was keep pressing forward. After what seemed like dozens but according to Eric is only 11 steps I lifted the first piece out and then it collapsed in a heap of sticks. They are particularly beautiful sticks which really show off an unusual grid design but after what happened there was no way on earth that I was going to be able to put it back together without assistance from Andreas' wonderful program. A major part of the fun with these puzzles for me is the creation of the Burrtools file and this was a pleasant diversion. After that assembling the puzzle was surprisingly simple using the guidance of the computer - Only 1 pair of hands required much to my relief. I have played with this for 3 evenings in a row whilst watching crap on TV (that's what I do when Mrs S is away!!! I play with toys, eat junk food and watch crap on TV - it gets it out of my system for a few months until her next trip back up North). So far I have managed to disassemble it 4 times and still have no idea how I have done it! This puzzle will have some lasting power as, at level 11, it is worthwhile attempting to understand it. I intend to keep trying until I have mastered it (both ways) without using the computer. I do wonder how many of these Eric assembled before he had it learned and could do it without Burrtools? I have another couple of toys for after I've mastered this one - I received a nice package from Bernhard Schweitzer at the end of last week and have another 2 "Turning Interlocking Cubes" to play with. Having gushed over the Little Kenny puzzle designed by Ken Irvine, I got a chance to try the Little Bruce brother that Allard had written about and which I had failed to solve at the last MPP. Bernhard had gotten permission from Ken to make a few after Eric had also released them and I jumped at the chance to obtain a copy. Bernhard's stuff is always very nicely made and looking up to my left in my study, I have a rather HUGE collection of his handiwork - lovely!!! Of course I cannot buy just one puzzle so I picked another TIC which he had available - Twisty Hollow by Tom Jolly looked like fun. These should keep me occupied until Xmas when I will get to start on the Stickman twisty tile puzzle. Nope! It's NOT a box.....it just happens to have a cavity! I recently got Loopy Burr; my first Eric Fuller puzzle. Heck, it's my first "designer" puzzle ever, actually! I loved it. I agree it got confusing after about four moves because at that point the whole thing kind of loosens up and it gets very hard to keep track of moves! Great design though with burr tools revealing 8 assemblies, so more fun to be had! Be careful Adam! It sounds like you're in danger of getting hooked like me! You'll end up spending a fortune and having no space left in your house! I'm glad to hear that you enjoyed your first Fuller puzzle. Don't kill my buzz, old man! Lol, you're not kidding though. Ive got about a dozen wire puzzles and a dozen hanayama/ misc. disentanglements. I don't have your money to spend but my collection is slowly growing. In the meantime I live vicariously through you. Everyone collects at the rate they can afford and I’m lucky enough to be a middle aged senior doctor with no children! This does give me a slight advantage over some! On the downside I have a Scottish wife with a whiplash tongue and a laser burning stair to keep me under control!